H ouse Republicans in the judicial redistricting committee and two Democrats voted Wednesday to move judicial maps forward despite nearly four hours of debate and public comment that included numerous requests to slow down. With few favorable amendments, the maps in House Bill 717 will remake the structure of the state’s court system, with particularly dramatic changes to urban areas. The superior and district court and prosecutorial maps were secretly drawn by Rep. Justin Burr (R-Stanly, Montgomery) and released on Twitter in June without notice to or consultation of judicial stakeholders. They were reviewed over about a month, tweaked once by Burr and once through the committee process and then passed in a 21-8 vote to be sent to the full House for consideration. The committee that met Wednesday was made up of 19 Republicans and 10 Democrats, with only one of the minority party’s several amendments for changes in the maps passing. Rep. Michael Wray (D-Halifax, Northampton) and Rep. William D. Brisson (D-Bladen, Johnston, Sampson) voted with Republicans to pass Burr’s maps. 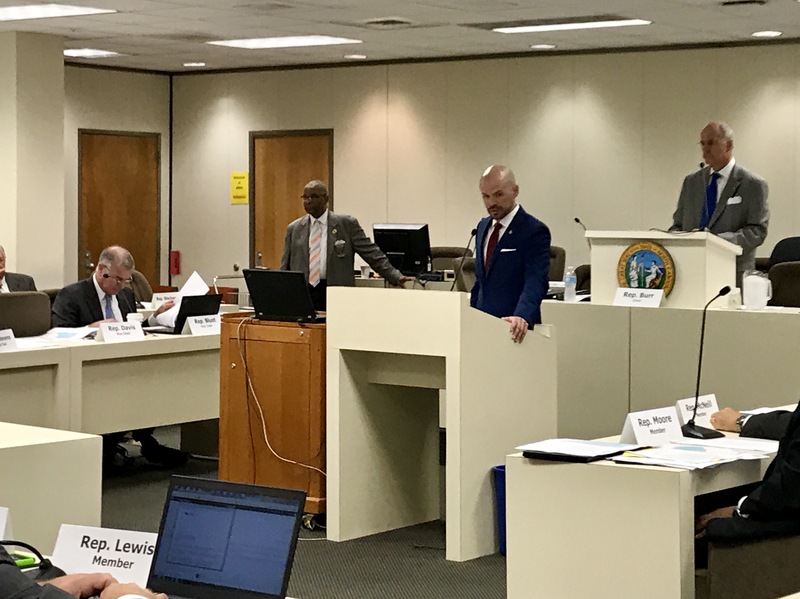 “It is long overdue for the General Assembly to update the framework of our judicial districts to reflect North Carolina’s changing needs and growth,” Burr said. He told the committee that “disenfranchised voters” in certain Mecklenburg County districts inspired him to reform the state’s judiciary. He added that he considered available resources, population, geography and only recently caseload, but not race, in the mapmaking process. The most recent version of the judicial maps, before amendments, were released just before midnight Monday. The maps released by the legislature did not include information about which judges and district attorneys in which districts would be affected. NC Policy Watch released maps Tuesday containing that information. 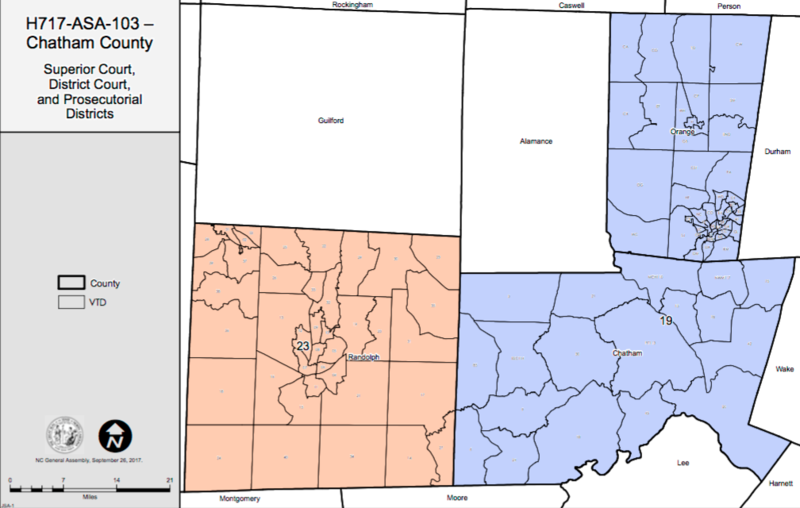 Most of the counties in the district and superior court maps are whole districts but urban counties are split into multiple districts. Wake, Durham, Guilford, Forsyth and Buncombe counties would no longer vote county-wide in district court judicial elections. Maps released Tuesday by NC Policy Watch detail the outcome of each district proposed in House Bill 717. There are 12 district court districts that double-bunk judges (pitting incumbents against each other in an election), 10 of which are majority Democrat. They include the following counties: Northampton, New Hanover, Cumberland, Hoke, Wake, Durham, Granville, Guilford, Gaston, Mecklenburg, Forsyth and Buncombe. There are judicial vacancies in 24 district court districts, 13 of which are majority Republican. They include the following counties: Nash, Lenoir, Pender, Columbus, Robeson, Cumberland, Harnett, Wake, Durham, Alamance, Rockingham, Durham, Guilford, Surry, Forsyth, Davie, Mecklenburg, Iredell, Wilkes, Burke, Rutherford, Henderson, Buncombe, Stanly and Chatham. In the superior court map, there are 9 districts with judges who are double-bunked, of which seven are majority Democrat. They include the following counties: Nash, New Hanover, Cumberland, Robeson, Union, Guilford, Rockingham, Orange and Buncombe. There are 18 superior court districts with judicial vacancies — three are majority Republican and six don’t currently have any sitting judges. They include the following counties: Beaufort, Granville, Duplin, New Hanover, Bladen, Johnston, Cumberland, Moore, Stanley, Randolph, Guilford, Iredell, Wake, Mecklenburg, Cabarrus, Gaston, Cleveland and Buncombe. There are three counties in the prosecutorial districts that double-bunk district attorneys — one Democrat and one Republican in Hoke and Moore counties; two Republicans in Henderson, Transylvania and Polk counties; and two Republicans in Surry and Stokes counties. Democratic legislators relayed concerns about double-bunking judges, noting that quality and experience would be at stake as a result. Several judges also relayed their own concerns about double-bunking. Republican lawmakers repeatedly in both Wednesday’s committee meeting and over the past couple weeks have criticized judges for seeking incumbency protection despite voting for such criterion themselves during recent legislative redistricting. An amendment to House Bill 717 introduced and passed Wednesday moves Republican Mecklenburg County Judge Sean Patrick Smith from one district where he was double-bunked to a district with judicial vacancies. Despite their criticisms, the committee voted Wednesday to change one precinct in one Mecklenburg County district to accommodate one Republican judge, Sean Patrick Smith. Rep. Andy Dulin (R-Mecklenburg) presented the amendment, which moved Smith from a district where he would have been double-bunked with 15 other judges in a 12-judge district to a district in the same county with four vacancies. The amendment, which was introduced by Wray, was passed and in addition to reducing the judges in Durham County, adds one to Halifax County — a district with a population of 51,766 compared to Durham’s 306,212, according to 2016 Census data. “This amendment is robbing Peter to pay Paul,” Morey argued. House Minority Leader Darren Jackson also spoke against the amendment, noting that Durham needs more resources, not less. He currently practices law in Durham and Morey served as a chief district court judge there. Every member of the public who spoke at Wednesday’s hearing, which included two retired judges, opposed Burr’s maps. 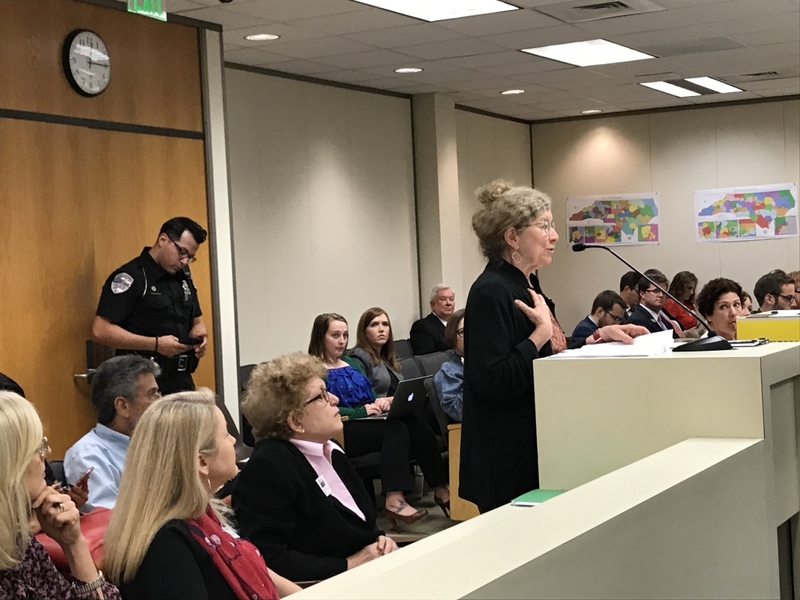 Nancy Gordon, a retired district court judge from Durham who is currently serving on the active emergency judge list, told lawmakers that judges are supposed to be politically neutral and “stacking the deck” does not support the Constitution or due process. Gordon and retired judge Pat Devine from Orange and Chatham counties were the only judicial officials who turned out at the public hearing Wednesday, although the heads of district and superior court organizations spoke at a committee meeting last week. Judges Athena Brooks and Joe Crosswhite, both registered Republicans, asked lawmakers last week to slow down the judicial redistricting process. “Redistricting is a process that should be accomplished in a deliberate manner; a thorough process which includes all judicial and legal stakeholders with the ultimate goal of the fair and impartial administration of law and justice always at the forefront of the process,” Brooks said. The State Bar and Bar Association, which represents attorneys in the state also echoed those judges sentiments last week. A number of North Carolinians and legislators spoke against a major change in Burr’s maps which would separate Chatham and Orange counties and pair the former with Randolph County. Devine and Morey also presented a letter to lawmakers signed by all judicial stakeholders in Orange and Chatham counties asking them not split the two. Chatham and Orange counties share a juvenile justice office, community corrections office, guardian ad litem office and attorney services, the letter states. Separating the two counties and pairing Chatham with Randolph “would disrupt a fully-functioning system and cause confusion and unnecessary complications to the administration of justice in all three counties,” it adds. House Minority Leader Darren Jackson introduced an amendment to keep Chatham County paired with Orange County after numerous requests from judicial leaders. It failed. 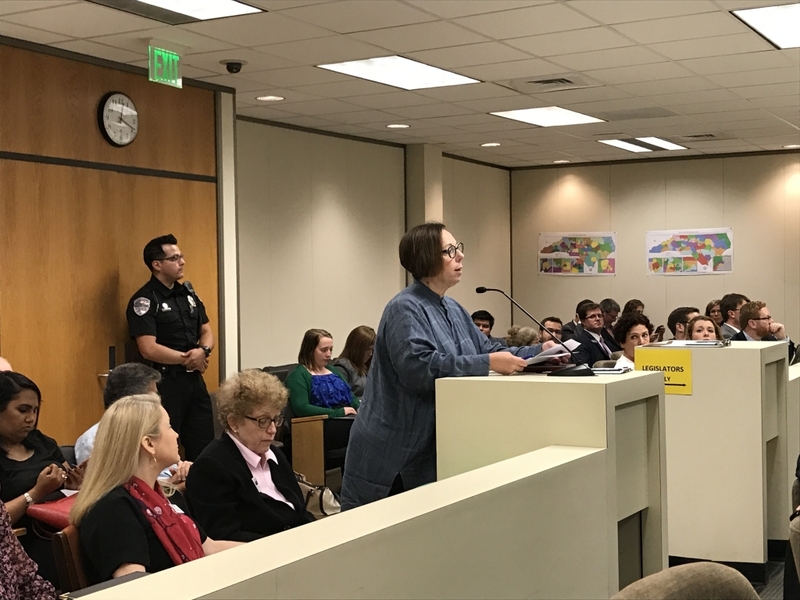 “The point is that you tear Chatham away from Orange County, Chatham County will experience a complete upheaval at every level of court services, not just in their judges,” she said. Becca Zirken, an Orange County resident, asked lawmakers not to pass HB717. Jackson introduced an amendment to keep Orange and Chatham counties in the same district, leaving Randolph on its own, and it failed. Rep. Joe John (D-Wake), a former state Court of Appeals judge, introduced an amendment to employ an independent judicial redistricting committee to complete the process that HB717 accomplishes. Burr called the proposal “insane” and it failed the committee. Before the final discussion on HB717, Jackson asked for a roll call vote, indicating that the maps could end up in litigation. Morey spoke against the bill, urging the committee to consider a more thoughtful approach. “If we keep saying now is not the right time to go, we just won’t ever go,” he said of requests to slow down the process. HB717 is expected to be taken up by the Courts Commission Friday and the full House chamber next week. this bill & its promotion are ominous threats undermine democracy as we know & revere our system of government.